There is a reason that house fires are one of the biggest fears among homeowners. A fire can start at virtually any time due to a variety of causes including cooking, electrical issues, unattended cigarettes, candles, and even a lightning strike. Once a fire starts, it spreads quickly through your home, causing significant, sometimes irreversible damage to your furnishings and belongings. It can be heartbreaking to watch everything you have worked for go up in flames and sustain major damage in what seems like an instant. Many homeowners may feel helpless after a fire has decimated much of their property. Fortunately, you can get the damage repaired and replace items that were destroyed by the fire through your homeowner’s insurance. Filing an insurance claim for fire damage is a multi-step process and some may not know where to begin. If your home sustains major damage from a fire, you must react quickly and follow these steps to file an insurance claim and get your property restored to its original, pre-fire condition. The first thing you should do once the fire department leaves your home is thoroughly document the damage. Take pictures and video of the damage throughout your home and create an inventory of your personal items that were damaged by the fire or smoke. It is very important that you document as much of the damage as possible so you can provide proof to your insurance adjuster. The more proof you have of the damage, the easier it will be to get your claim accepted. If your home is unsafe or unstable after the fire, document as much of the damage as you can without putting yourself in danger. Important to remember: Do not throw anything away, no matter how damaged. Fire damage restoration professionals can effectively restore severely damaged items. The damage from a fire doesn’t end when the fire is put out. Smoke, soot, and other corrosive byproducts created by the fire will continue to spread and cause further damage. These materials burn, etch, and tarnish affected surfaces and objects in your home, and this damage will become permanent unless the affected materials are treated immediately. You must call a fire damage restoration professional at this stage to treat damaged materials and restore them before they become permanently damaged. If your home is unstable after the fire, restoration professionals can also secure and stabilize it with board up services and roof tarping. 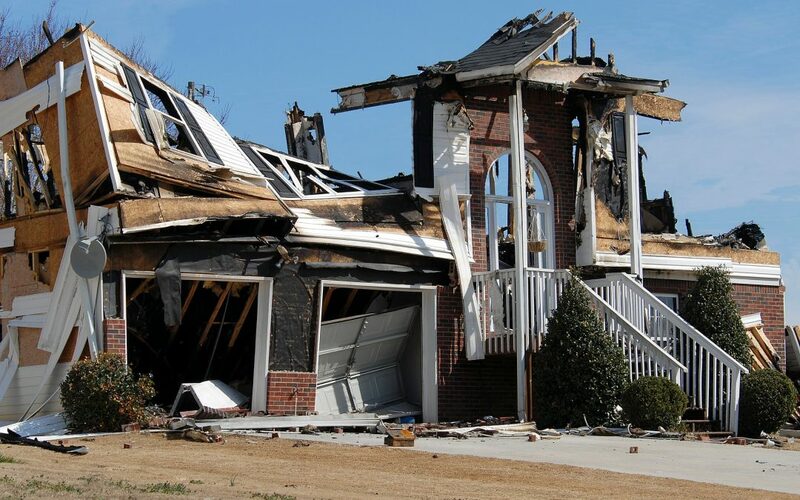 The goal of this stage is to secure your home and prevent additional damage as the insurance claim process plays out. Do not ask these professionals to proceed with the reconstruction or restoration until you have filed your claim. Important to remember: Your insurance company should cover the costs of these initial services, so keep detailed records of your expenses. Fires usually leave homes uninhabitable, forcing homeowners to stay at a hotel or with friends or relatives until the restoration is complete. If you are forced to leave your home, your insurance company should pay for your living expenses. You can either ask your insurance provider for a cash advance to cover your living expenses, or document these expenses to include them as part of the claim. Keep in mind that your insurance company will only cover the cost of essentials such as hotels, food, clothing, and toiletries. After you have documented the damage, secured your home, and found a temporary living situation, you must call your insurance provider to start the claims process. Your insurance company will send a claims adjuster to your property within 15 days to inspect the damage and make an estimate for the repairs. By law, your insurance company must react to your claim within a reasonable amount of time. If your insurance company accepts your claim, they must give you the money within 5 business days. If your claim is rejected, your insurance company must provide an explanation in writing. Important to remember: Document every interaction you have with your insurance company including phone calls, letters, and emails. Record the date, time, and content of the interaction. This will help you if you have a dispute with your insurance provider. Now that your insurance company has filed your claim, you can call a fire damage restoration professional to provide an estimate and repair the damage. Most insurance providers work with restoration professionals to come up with an agreed estimate. These professionals have plenty of experience dealing with fire damaged homes and they may find something that the insurance adjuster missed. Once the restoration professional and insurance company agree on an estimate, the restoration work can begin. Important to remember: Your insurance company may suggest a restoration professional to work with. However, it is your legal right to choose any restoration service provider and your insurance company will work with them. Watching your home go up in flames is a horrifying experience and it is natural to feel helpless after the fire is out. By following these insurance claim tips immediately after the fire, you can limit the damage to your home and get through the claims process quickly to get your home, and your life, restored.